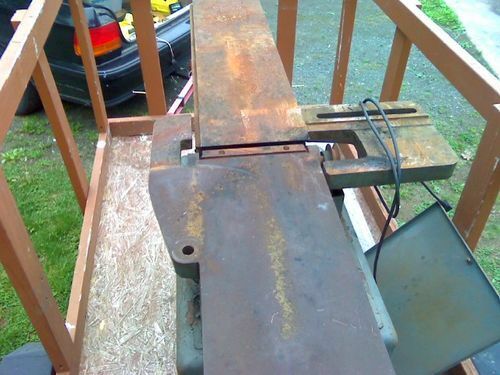 A fellow LJ (Dusty56) recently posted about about using Evapo-Rust for rust removal from his jointer tables. I decided to buy a gallon and try it. All I did was take a wire brush the parts to remove the loose scale and place parts into a plastic container. I poured in just enough ER to cover all the parts and then let everything sit for 6 hours. After removing the parts from the solution, I gave them a quick brushing using a brass brush. Keeping the container in a warm place helps with the chemical reaction, so I let everything sit on the tailgate of my truck today. Not much else to say…... the parts were ready for final dressing with minimal effort. I recently purchased some Evapo-Rust, for a few “projects”. I’m now excited & motivated to put it to use. I’ve had great results with Evapo-Rust too. Does work well, doesn’t it? One nice thing is that you can pour it back into the jug and reuse it, but you should strain it through a coffee filter. My only disappointment with evapo rust is that is does not leave the old patina. 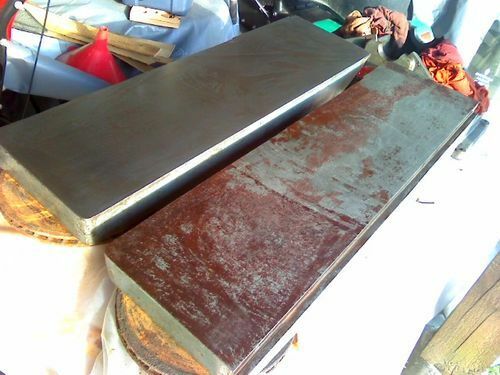 In using electrolysis the patina is maintained. Until you try electrolysis you will not see what I am talking about. To me the evaporust leave the part “too bright and shiny”. Shipwreck , I’m glad that you had success with the ER…I see that they changed the label since I bought my last gallon , and the price has gone up to $22 from $20 at Tractor Supply. How much did you pay for yours ? Powermatic 60…8” jointer tables being restored by EvapoRust and a little Elbow Grease. 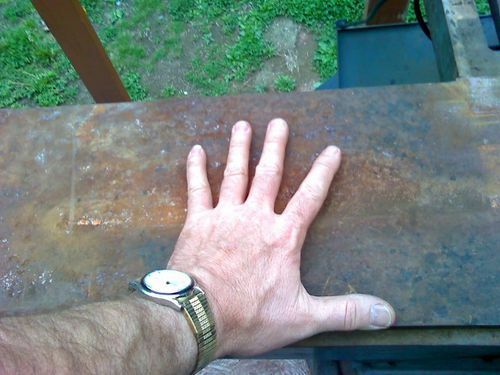 I find that evaporust works well on cast iron but not as well on tool steel. Is there a better method? I paid $29.00 at Harbor Freight. The closest Tractor Supply is in Smithfield which is 35 miles from me. MedicKen: I hear ya…. butIm going after the bright and shiny. I am going to try a little electrolysis on my next finds. Does it effect wood handles or totes at all? 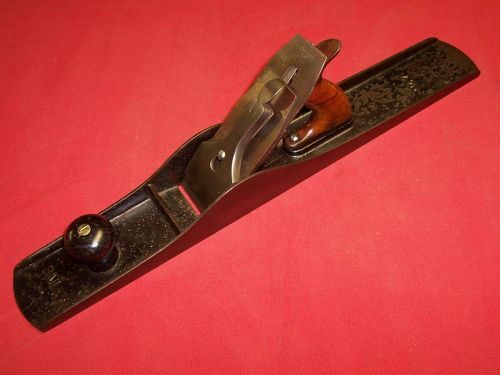 I have a plane that i can’t remove the lower tote screw on due to corrosion, and some of the older rosewood handled monkey wrenches I’d like to clean up. I use a fine wire wheel for most things but you can’t get in all the nooks and crannies. I used it on a hatchet and the only thing that happened was the handle was no longer loose in the head. I had to, unfortunately, place all my shop into storage for a couple of years. Now I have some serious rust problems on my jointer, lathe, and drill press. I managed to clean up the table saw using penetrating oil and elbow grease. This is the first I have heard of this product. Can you tell me if I will have to disassemble and soak or can it be applied and worked on the tools? It sounds like exactly what I need. RTex , as you can see from my jointer tables , they are too big to submerge. I saturated some old rags with the product , placed them on the tables and left them alone for a few hours. I had placed plastic sheeting over the rags to help stop evaporation of the product. Old T-shirt material works best for me…I tried the red shop rags and you can see the difference that the cloth makes in the end by looking at the table on the right…the more open weave in the red rags left the cloth pattern on the cast iron.I was able to remove it with reapplying the t-shirt cloth to the same areas. Best wishes on your projects. I guess I need to elaborate a little on the “bright and shiny” comment. I know that evaporust works and have used it myself. 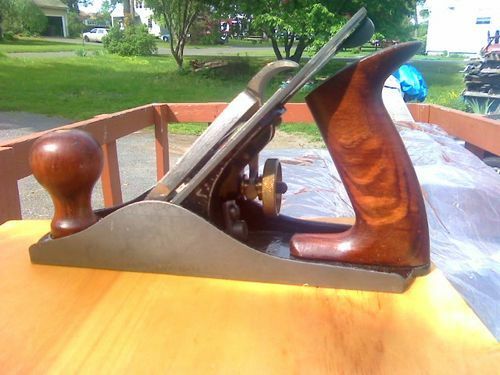 However, I do not want an old tool to look like it was machined. I like the look of the old cast iron surfaces to have some age to them. Cast iron as it ages has a very nice dark gray color that I prefer. Steel does as well. To me its a personal preference, some like the brand new shiny surfaces, its just not for me. I understould you Ken. I love the look of patina myself. I left my #7 with the patina and it looks nice sitting beside my other shiny planes. Most of my planes were pitted pretty bad, so I gave the them alot of sanding to dress them up. The 7 was just about perfect when I got it, so I left it alone. The japaning could use some help, but I’ll get to that some other time.